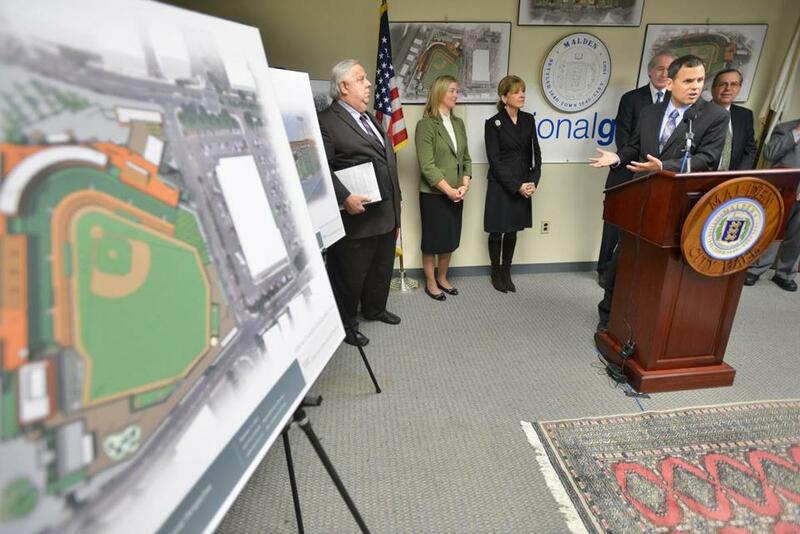 Malden Mayor Gary Christenson spoke during a December 2013 press conference to announce an agreement to build a minor league ballpark on the former National Grid site in downtown Malden. The groundbreaking in a long-running project to build a minor league baseball stadium in Malden is now targeted for summer, with the first pitch at the ballpark thrown in 2019. At a Dec. 13 Malden City Council meeting, Mayor Gary Christenson said Pat O’Conner, president of Minor League Baseball, has allowed the Malden Field of Dreams project developers to seek a team with a Major League affiliation. Christenson’s progress report came at the behest of councilors frustrated by a seeming lack of advancement of the project, proposed in 2011 and originally estimated to be finished by 2014. “The benefits of having an affiliated team rather than an independent league team, which was the original proposal when this process began, are many,” Christenson told the council, noting that affiliated teams get financial and personnel support from their Major League teams and include prospects being prepped to rise in the system. “This has been a highly complicated process, but . . . the developer can now begin the process of securing a team,” Christenson said. Alex Bok, the developer who founded Malden Field of Dreams, will deliver a detailed summary of where the project stands to the council on Feb. 7, he said in an e-mail to the Globe. The proposed nine-acre site encompasses a National Grid-owned parcel on Commercial Street and three other private parcels on Canal and Center streets, said Deborah Burke, the Malden Redevelopment Authority’s executive director. Developers must negotiate with the property owners, as City Council members have expressed reluctance to take property by eminent domain. The proposed 6,000-seat stadium, across from the MBTA Orange Line, would include 16 private boxes, a kids’ zone, and a family-oriented grass picnic area, an online description of the plans said. The $60 million project would be financed privately, and the developers would not seek any bonding authority or other financial assistance from the city. Councilor Neal Anderson said the project would be a boon for Malden and hopes Bok’s presentation will quell concerns about the pace of the work. Paul Condon, another city councilor, supports the project but remains “very skeptical” that the developers will demonstrate much progress. Sean Teehan can be reached at spteehan@gmail.com.